The Bearded dragon originally from the central desert areas of Australia is an ancient lizard, who gets its name from its physical appearance, having a flap of skin that extends from under the chin that resembles a beard which is extended to ward off attackers, they are generally mild tempered, which makes them tolerant of humans. Male lizards however are territorial and will fight and should be kept separate. Their natural habitat must be imitated as best as possible to maintain a healthy lizard. Heating is most important along with lighting, as are the substrate and basking areas and humidity level. Keeping lizards of any species must not be taken lightly, their lifespan ranges from three to ten years with the correct care. They do require attention to keep them healthy and all prospective owners should be dedicated to their care. Bearded dragons can grow to 18 inches long, the average adult will grow between 12 and 18 inches long. Fifty percent of its body length will be made up of its tail. Considering the size that they grow to, it is wise to bear this in mind when purchasing a vivarium, buying one that is large enough to allow for growth and normal behavior, that will last the lizards lifetime will save the expense of upgrading to a larger size. 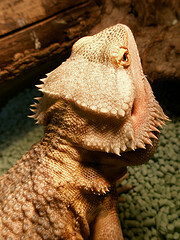 A bearded dragon lizard will achieve full adult size within twelve months given the correct care and conditions. As lizards vary so much in their size and behavior it is advised that you talk to a qualified reptile veterinarian to discuss housing size. The correct habitat mimicking its natural environment can be made inside the vivarium, starting with the substrate (floor) use either reptile-carpeting or calcium based sand, never use silica based sand, as if ingested can cause impaction. The habitat should be made up of branches, to allow places for basking, provide a secluded place where your bearded dragon can hide. Place a shedding box filled with sphagnum moss in the vivarium to aid the skin shedding process which occurs often with bearded dragons. Maintaining a humidity level of less than 50% by misting when necessary is important in helping the shedding process, in addition to the shedding box, bath time will assist in the shedding, by allowing the lizard to immerse its complete body in water. Having replicated the garden of Eden or what looks like the Australian out back for your lizard bear in mind that the vivarium will need to be cleaned once per week, best advice keep it simple. Using a weak bleach solution of 3%, scrub the entire inside of the vivarium and its furniture, then rinse thoroughly until all smell of bleach has gone, dry off the glass and furnishings, replace fresh sand. It is useful to have a secure second tank to keep your lizard in while you are performing the cleaning task, hygiene is of paramount importance if you wish to keep a healthy environment for your lizard. As a main source of heating use a incandescent light or a ceramic heat pad. The temperature should be gradient 100 degrees F at the warm end and 70 degrees F at the cool end. Full spectrum UVB lighting for ten to twelve hours per day is needed, an incandescent bulb may be used for daytime basking only. 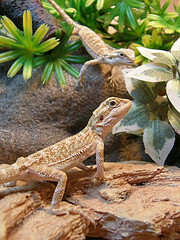 There are many benefits to feeding commercially prepared bearded dragon food, it is readily available and stores well, however the best diet includes 70% recently fed crickets, meal-worms or super-worms and 30% mixed vegetables and fruit. Fresh clean non chlorinated water should be readily available, young lizards should be fed daily, while adults can be fed between three and five times per week. Adult lizards eat more vegetables than live food, young lizards will prefer more live food. A healthy lizard will be active and alert, although he will spend part of the day hidden away but not for long periods of time and some of the day just basking, eyes will be clear, full tail and healthy looking skin. Eating should be regular and droppings firm. Signs of illness are characterized by loss of weight and poor appetite, swelling, mucus in the nose or mouth, lethargy, bumps, sores on the skin, paralysis of the tail or limbs, abnormal feces. Any of these symptoms should be followed up by a visit to a venetian who specializes in reptiles. the advice given here is not meant to be a substitute for veterinarian care, and their assistance should be sought in all cases of illness. Reptile Supplies | Save 20-50% Off + Free Shipping! 18 IN. X 18 IN. X 24 IN.